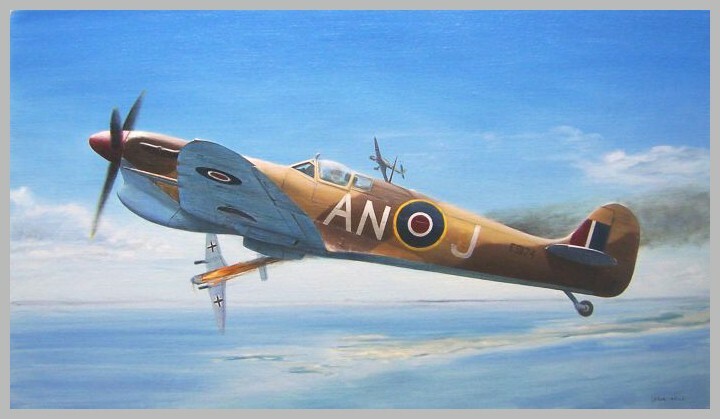 Entitled “Se va la Primera”, this painting by Vladimir Urbanek shows Supermarine Spitfire Mk.Vc ser.no. ES124, AN-J of No. 417 Fighter Squadron RAF. The scene depicts action on 19th April 1943, with Argentinean pilot F/Lt Bernardo De Larminat DFC at the controls. “I went to spiral down to the deck and headed home across the peninsula at O feet. As I reached the coast on the other side North of Nabeul. I saw two stukas lown and flying formation. I was about in the line astern and I opened fire on one them at 150 yards.